Heart attack is a major cause of deaths around the globe. Although the cardiovascular problem is genetic, it can be avoided by taking proper precautions and lifestyle modifications. Medical fraternity has provided important suggestions to avoid heart attack following laborious research and observations. One must become responsible for own health and identify the various risk factors associated with cardiovascular complications like heart attack. People with family history and advanced age are most prone to a heart attack. 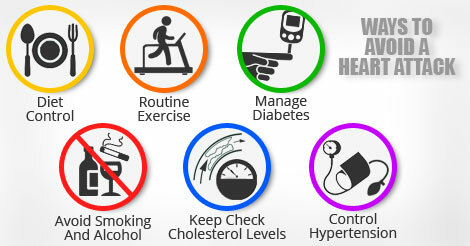 Chronic conditions like hypertension, high cholesterol and diabetes increases the risk for heart attack. Smoking and alcohol abuse increases the risk of heart attack by many folds. Always try to manage the modifiable risk factors for heart attack. For an adult person a blood pressure of 120/80 mm Hg is considered ideal. Research suggest that increase in upper limit blood pressure (systolic) by 10 mm Hg and lower limit blood pressure (diastolic) by 5 mm Hg double the risk of heart attack. It is therefore advisable for a hypertensive patient to keep a check on blood pressure by regular monitoring and routine medications. Lipids and cholesterol gets deposited on the walls of blood vessels which carries oxygenated blood to the muscles of heart and thus narrow them. Narrowing of blood vessel reduces the supply of oxygen to heart and on long terms lead to heart attack. It is therefore advisable to keep the blood lipid levels and cholesterol within limits to reduce the risk of heart attack. Long term and uncontrolled diabetes damages the heart muscles and increases the risk of heart attack. Diabetic patients must therefore properly control their diabetes by regular monitoring and appropriate medications. Obesity and stress is a major risk factor for heart attack and related deaths. Lifestyle modifications including diet control, routine exercise regime and stress relief are important to avoid heart attack. Men and women at high risk of heart attack must limit their calorie intake by 1500 and 1200 kcal respectively and must include more protein and fiber rich diet. 30 minutes of aerobic exercise like walking also reduces the risk of heart attack. Smoking affects the function of lungs which are responsible for providing appropriate oxygenation to vital organs including heart. Research suggest that smoker has 60% more chances to have a heart attack as compared to a non-smoker high risk patient. It is also important to avoid second hand smoking.